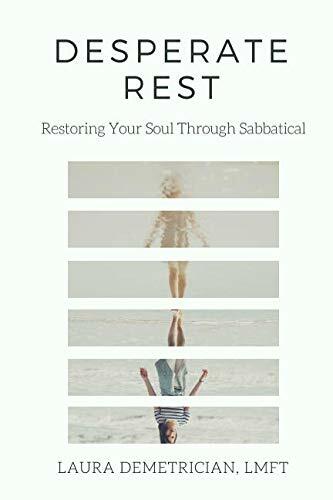 Laura Demetrician’s book, “Desperate Rest: Restoring Your Soul Through Sabbatical” is available. Desperate Rest,set in the context of Laura Demetrician’s healing journey, is a helpful and peaceful guide to taking a sabbatical. This book is an invitation to journey with the Good Shepherd as you create space, plan your sabbatical, and surrender to the path the Lord leads. Go from exhaustion to peace and from scattered living to intentional purpose. Enter sabbatical as you are. Start with rest. Walk out the other side refreshed and restored. You can see more about Laura and her ministry, Tree by Water, at www.treebywater.org. Desperate Rest, set in the context of Laura Demetrician’s healing journey, is a helpful and peaceful guide to taking a sabbatical. This book is an invitation to journey with the Good Shepherd as you create space, plan your sabbatical, and surrender to the path the Lord leads. Go from exhaustion to peace and from scattered living to intentional purpose. 1. Free Ebook - By signing up for our email list here (which is sent out on an average of 1 -2 times per month), you will recieve instructions to get your copy of "Desperate Rest: Restoring Your Soul Through Sabbatical." 2. For Paperback or E-book Purchase - Find it at Amazon.com, Barnes and Nobles, and other retailers.